St. Andrew Parish is proud to sponsor our local council of the Knights of Columbus. This all men's group seeks to further support the parish, vocations, and Church's mission at large. Please contact the Grand Knight listed below for further information about their meetings and group. Currently, our monthly meeting is every First Wednesday of the month at 7:00 pm. Join us for our parish's men group or talk to Fr. Marco or any Knight to learn more about this fraternal organization. Knights of Columbus St. Andrew Council website. HarperCollins (2005), pp. 142. ISBN-10: 0-06-116145-4; ISBN-13: 978-0-06-116145-2;Amazon. 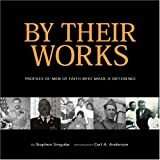 By Their Works is a lively, well-illustrated look at the lives of men whose lives and faith were powerfully influenced by their membership in the Knights of Columbus. It is a high-quality “coffee table book” with dozens of photographs and other illustrations. Written by Stephen Singular, By Their Works includes chapters on many well-known Knights, including Babe Ruth, John F. Kennedy, and Vince Lombardi. But it also includes many extraordinary but less well known Knights, such as Father Thomas Mulcrone and James Connolly, the first American to win an Olympic gold medal in modern times; Lt. Daniel O’Callaghan, a New York City firefighter who lost his life trying to rescue others at the World Trade Center on 9/11; and Sgt. Maj. Dan Daily, a two-time Medal of Honor winner once described by the commandant of the Marine Corps as “the outstanding Marine of all time.”Others profiled include...Read the full article at kofc.org.